Wetaskiwin born, Don Duncalfe is being inducted into the Wetaskiwin and County Sports Hall of Fame for being the first graduate of the Wetaskiwin High School Sabre Football program to have a professional football career. 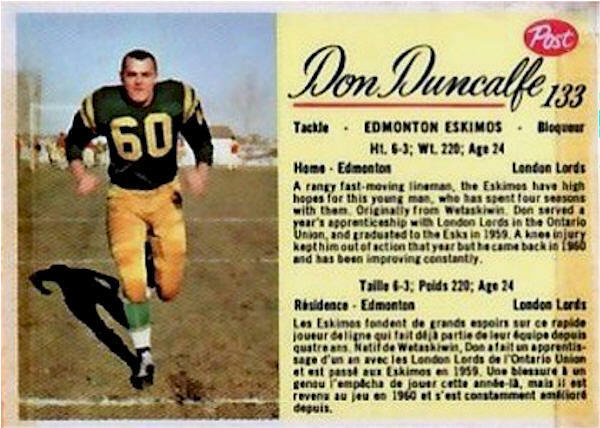 In 1958 Don played for the London Lords of the Ontario Rugby Football Union and for five seasons from 1959 - 1963, Don was a member of the Edmonton Eskimos Football Team of the CFL. During his Eskimo playing years Don played with many former Grey Cup Champions and future Canadian Football Hall of Famers. Don started playing high school football for the Wetaskiwin Composite High School Sabres when he was in Grade 10 under head coach Norm Brown and assistant coach Pete Durnovo. 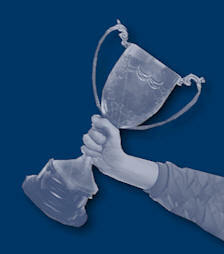 He was a member of the 1954, 1955 and 1956 teams that won three league championships and twenty-three games without a loss. Don was co-captain of the 1955 and 1956 teams and played both Offensive Tackle and Defensive Tackle. In six league games, the first play-off game and an exhibition game the 1956 team was so dominant that no points were scored against them. The 1956 team was inducted into the Wetaskiwin and County Sports Hall of Fame in 2009. Don and two of his 1956 team-mates, Al Sandahl and Daryl Maki, were invited to the Edmonton Eskimo Rookie Tryout Camp in their grade 12 year confirming their exceptional ability and the high quality of play demonstrated by the Sabres dynasty of the 1950’s. During the Rookie Camp Eskimo head coach “Pop” Ivy was so impressed with Don and Al that he invited them to attend the main training camp later in the summer. 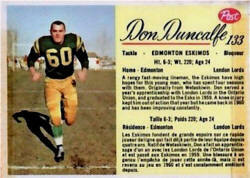 After the main training camp, Don played Junior Football with the Edmonton Huskies for the 1957 season. That year the Huskies were Alberta Junior Football League Champions, won the Alberta-BC playoffs but lost in the Western Canada finals. Don’s outstanding play with the Huskies resulted in him being invited once more to the Eskimo training camp in 1958. This time he was assigned to play on the Eskimos development team, the London Lords of the Ontario Rugby Football Union. For both the Huskies and London Lords, Don played both ways as a Defensive End and Offensive Tackle. In 1959, at the age of twenty and after a brilliant season with the Lords, Don earned a spot on the Edmonton Eskimo roster and played on the team from 1959-1963. For Don to play football in the CFL required not only athletic ability and a high level of skill but as well hard work, determination and dedication. Don played various positions with the Eskimos including Defensive End, Offensive Tackle, Offensive Guard and at times Offensive Center. He also played on the Eskimos special teams. 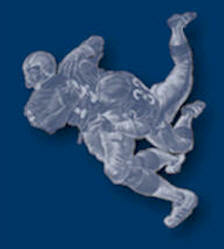 Several of his team-mates played on the previous Grey Cup Championship Eskimo teams of 1954, 1955 and 1956. The most successful team during Don’s tenure with the Eskimos was the 1960 team that played in the Grey Cup Final losing to the Ottawa Roughriders 16-6. Six of Don’s Eskimo team-mates were inducted into the Canadian Football Hall of Fame and eight were enshrined onto the Edmonton Eskimo Wall of Honor. They included: Jackie Parker, Normie Kwong, Rollie Miles, Johnny Bright, Roger Nelson, Tommy Joe Coffey, Don Getty and Oscar Kruger. Making it into the Eskimo line-up and playing with these Eskimo “legends” and elite players was indeed a testament to Don’s playing ability and talent. Due to injuries, Don retired after the 1963 season. He was able to fulfill his dream of playing professional football and was able to join his boyhood heroes on the football field and in the locker room. Don’s career was especially amazing as when he was a young boy he contacted polio. Both of his legs were paralyzed for over a year and then he underwent lengthy treatment in a clinic. Don credits his Wetaskiwin High School football experience for providing him with basic football skills, the importance of teamwork and his love for the game. As a professional football player with the Edmonton Eskimos, Don was a role model for young Wetaskiwin football players and brought recognition to himself, his family and his community. Wetaskiwin is proud of Don’s accomplishments and we are honored to induct him into the Wetaskiwin and County Sports Hall of Fame. Read the opening comments made by Colleen Grinde when introducing Don Duncalfe.